If you would like to send in a treat for your child’s birthday we have 20 students in the class. Please do not send treats containing nuts. Napkins are also appreciated! If you want your child to deliver birthday party invitations at school, please make sure they have one for each student. Thank you for your cooperation! It is important for students to stay hydrated. Students are permitted to bring a bottle of water to keep at their desk. Our water fountain in our classroom is not operational, and this will help limit the distraction of having students asking to get a drink in the hallway. Please make sure you send in water bottles that are spill-proof. Thank you for your cooperation! 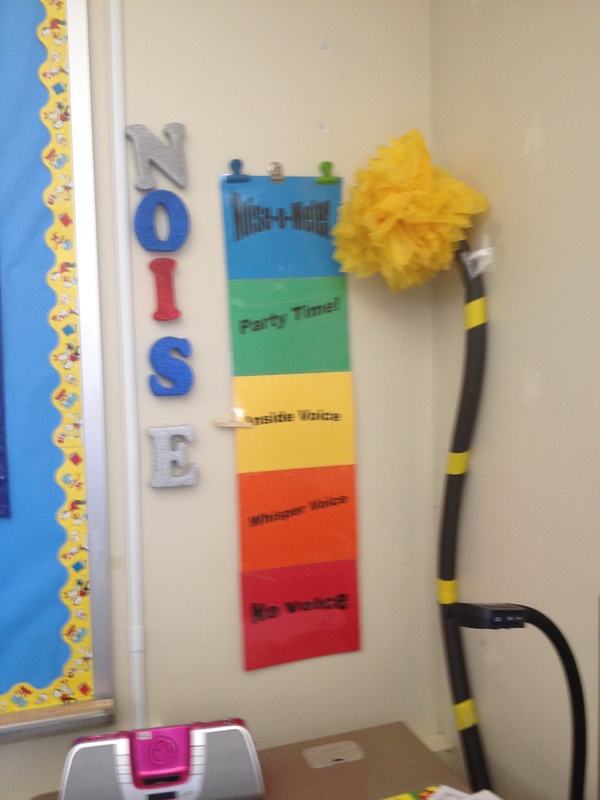 The Noise-O-Meter will help student gauge what their voices should sound like. For example, while we are playing a game they should use their inside voice. When they are completing seatwork, students should use a whisper voice. During a test there should be no voices. I also have the letters N-O-I-S-E, if I have to remind the class to lower their voices I will take a letter away. The class will be able to earn letters back. If it gets down to N-O, this means no recess that day. 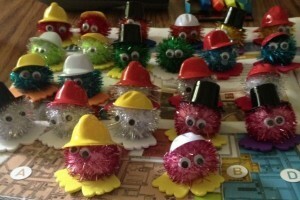 Also, I use quiet critters during no-talking times. If a student talks they will lose their quiet critter. If a student keeps their quiet critter they earn a sticker or stamp when the no-talking time is up! Getting Organized: Desks, Folders and School Supplies! 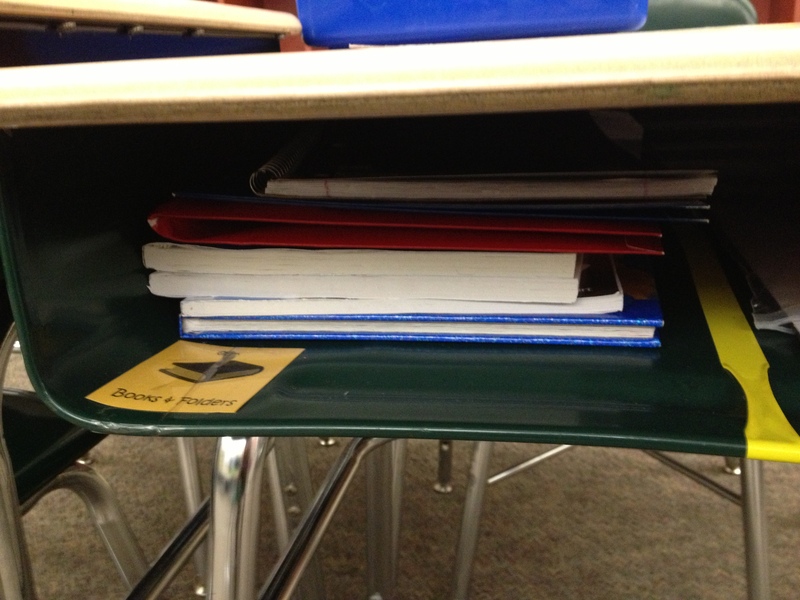 Desks: I have divided student desks into two sections by running a piece of tape down the middle. 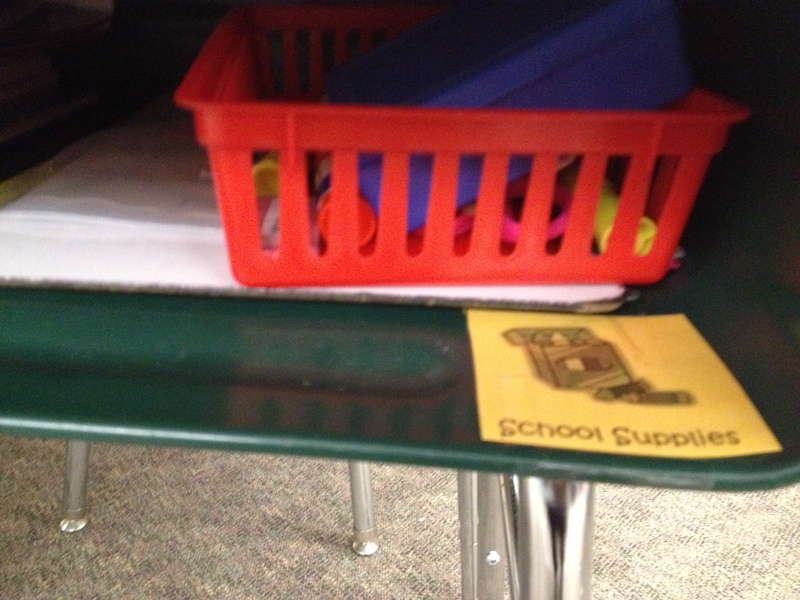 One side is labeled “Books and Folders” and the other side is labeled “School Supplies”. On the “Books and Folders” side students keep their books, workbooks and blue, red and green folders (see below). On the “School Supplies” side, students keep their White Board Slate Bags and School Supplies Baskets. White Board Slate Bags: Students are to keep their dry erase white board slate in a gallon sized bag that I labeled with their name. Also, included in this bag are two dry erase markers and powder puff to serve as an eraser for their board. 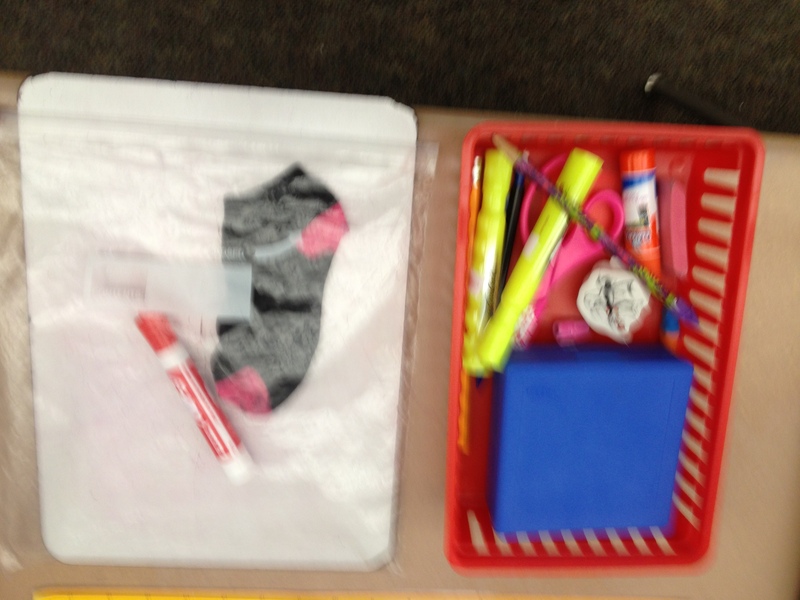 School Supplies Basket: I have provided a basket for school supplies for each student in their desk. They will keep 4 pencils, 2 erasers, 2 glue sticks, and 1 box of crayons All other supplies will be kept in their pencil box or gallon sized ziplock bag in their cubby until needed. Please make sure you label any additional school supplies you may send in. I labeled anything that was sent in on the first day. Thank you for your help in this matter! note: This picture was taken last school year, when we used socks instead of powder puffs for erasers! School Supplies: Please check in with your student throughout the year to make sure the have ample crayons, erasers, glue sticks, and dry erase markers. Here is the link to the Ambridge Area School District Supply List. Additionally, donations of boxes of pencils and large (class-sized) bottles of hand sanitizer are appreciated! 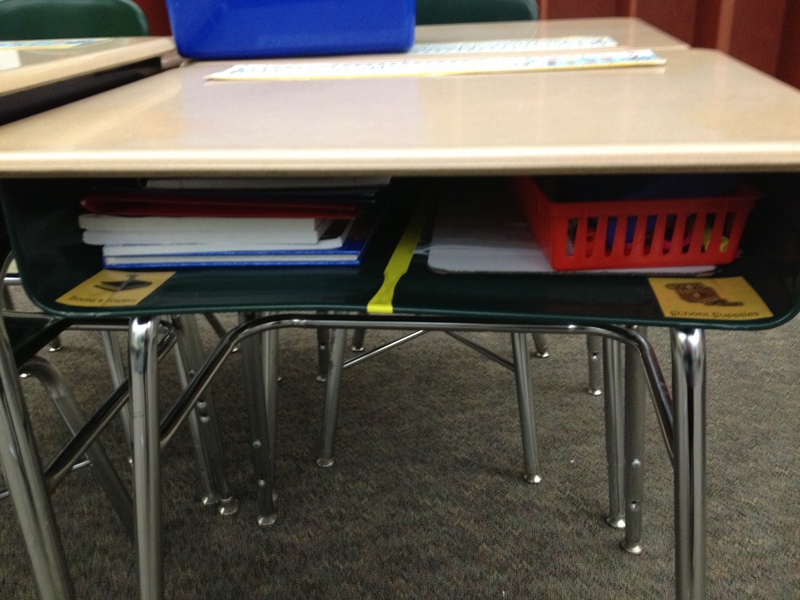 Folders: Students will have 4 color coded folders to help stay organized. Please encourage your child to take special care of their folders. Under Construction Folder- Red (Kept at school for work that needs to be completed). Friday Folder- Yellow (Please check and sign every Friday and return to school on Monday) I send home tests in this folder. I provided the Green Take Home Folder, and the Yellow Friday Folder for your student. Please make sure you send in red and blue folders, if you have not done so already, to serve as their Under Construction Folder and Intervention Folder. Thank you! I labeled one red and blue for each student and stored the extras in their cubbies in case their folder gets ripped or torn. Bathroom, Hall Passes and Hand Signals! In our classroom one of our rules is to “Raise Your Hand”. 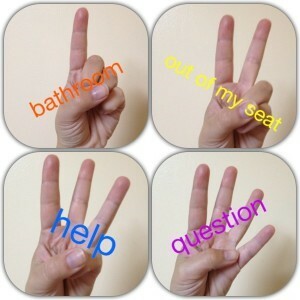 I have 4 hand signals for students to use to gain my attention. 1 Finger: “I need to use the bathroom.” When student is granted permission to use the bathroom, they must move their magnet on the door from “in the room” to “bathroom”, and take the bathroom pass. We have a Girls’ Pass and Boys’ Pass. Of course, I let students know that if they have an emergency they may go, and let me know on their way out the door! I ask that students limit their bathroom usage to twice in the morning and twice in the afternoon. If your child has special bathroom needs, and needs to use the bathroom more than 4 times a day, please let me know! I encourage students to ask to use the bathroom during down time like 1st thing in the morning, during seat work or “brain breaks” instead of times when I am teaching. Please review these procedures with your child at home. Thank you! 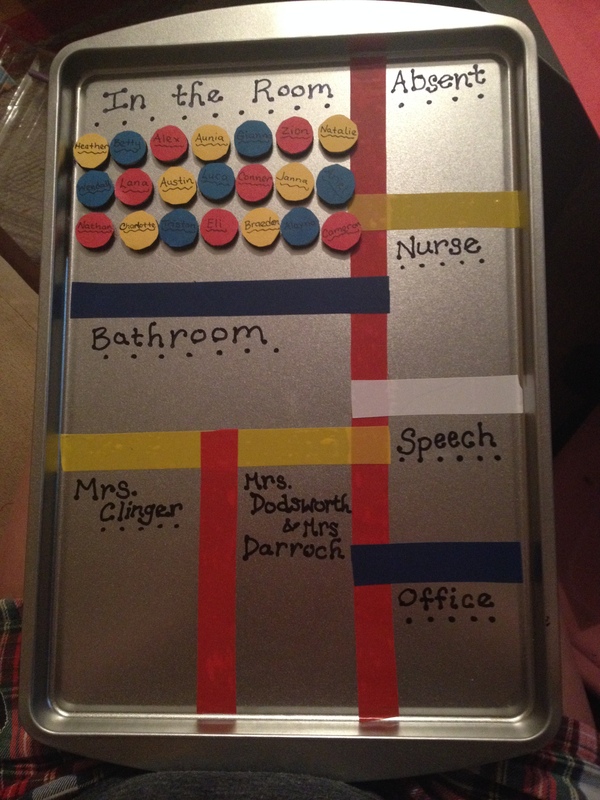 Other hall passes include: Office Pass, Hall Pass and Nurse Pass. When a student is leaving the room they move their magnet and take the appropriate pass, so I have a quick reference of where everyone is! 2 Fingers: “I need out of my seat”. This is used when a student needs to a get a pencil from the Sharp cup, or they need to go to their cubby for something! Students are not permitted to get out of their seat without raising their hand. Please review these hand signals with your child at home! In order to eliminate the distraction of sharpening pencils during the day, we will have two pencil cups. When a student needs a new pencil, they will place their pencil in the broken cup and take one from the sharp cup. Any special pencils they do not wish to trade in must be sharpened by the designated pencil sharpener before the morning bell. 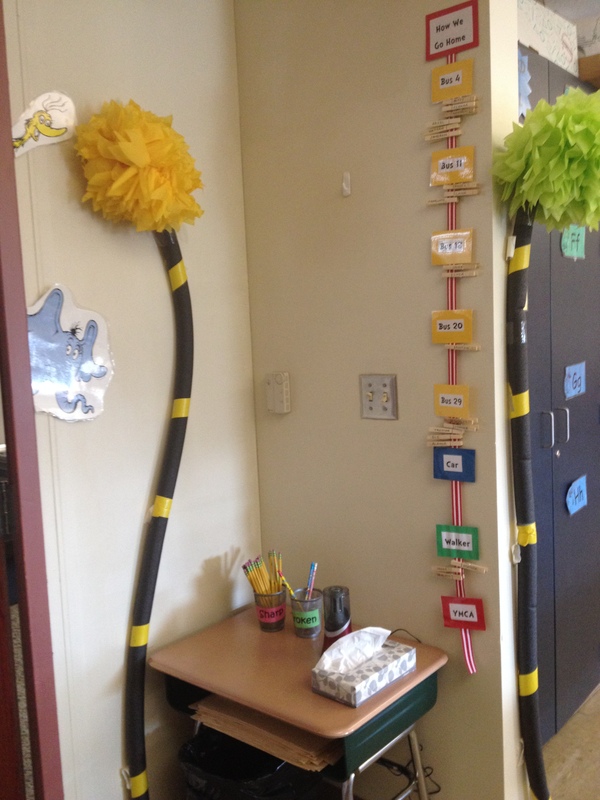 Each student is to keep 4 pencils in their basket in their desk. I ask that all student bring in at least 1 box of pencils for me to store in the cupboard, because we share pencils in the class, I like to refresh the sharp cup with a fresh batch of pencils each week. My favorite brand is Dixon Ticonderoga, because I have found the sharpen the absolute best! Thank you for your support!! 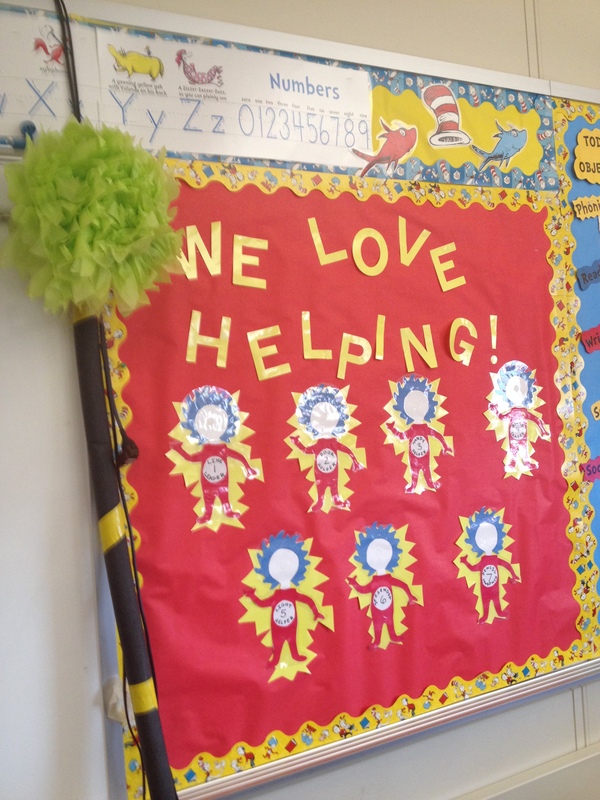 Students will rotate with helping out with these classroom jobs. Students photos were taken on the 1st day of school and will serve as the faces of the job “Things” on our job chart. Jobs are switched weekly, and each child should have the opportunity to do each job at least once this school year!